One of cycling’s greatest attractions is the popular communion on a Sunday between the peloton and the spectators. A race goes to the people, it passes your front door and the local café, school, supermarket and church. No other sport can reach these places in the same way. Now a survey of Belgian races has raised the prospect of charging for access to bike races and the idea of getting ticket revenue from roadside spectators. Outrageous? Not really. It’s been done before and happens already but it would mark a cultural and economic change if it spreads further. With this in mind it’s worth exploring further. First this isn’t new. Races have long charged spectators, indeed one reason Paris-Roubaix begun in 1896 was a ruse to fill up a new stadium with fee-payers. Many races used to in a velodrome or even an athletics track in ensure a captive audience paying tickets and people were only to happy to pa. Because there was no TV this was the way to ensure you say the “giants of the road” up close. Today some of the post-Tour criteriums do it and several pro races in Belgium do too. 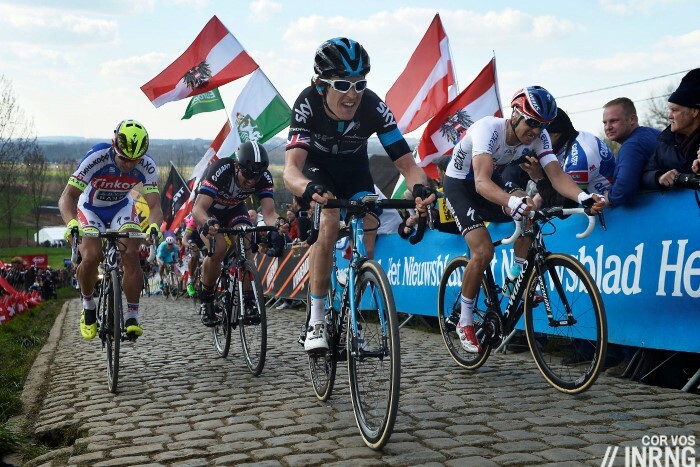 The Tour of Flanders has the giant VIP zones on the Paterberg and Oude Kwaremont within those white tents and lowlier events like the Nokere Koerse and Belgian national championships close off part of the circuit and charge for access. It’s not just that it can be done, it is done. Spot the white VIP tent in the background on the left? So the next question is whether this will happen more? The arguments are obvious when set against the sports constant refrain: a lack of money in the sport. 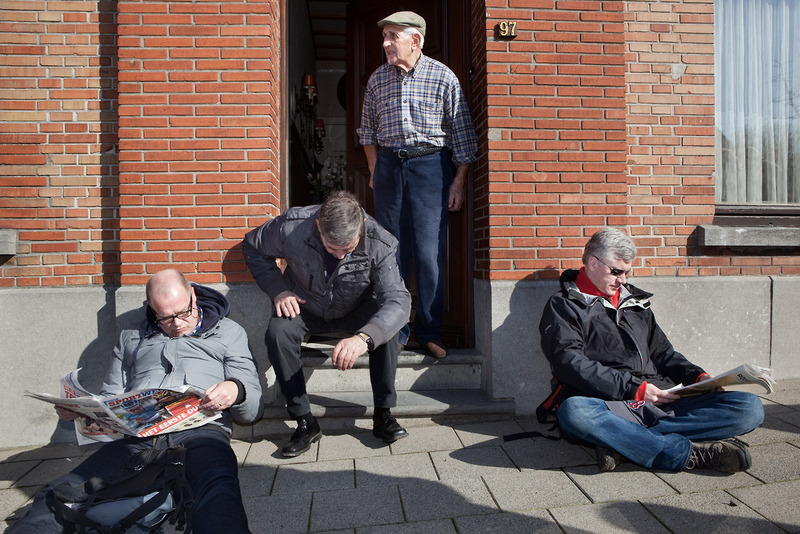 Marketing literature from the Tour of Flanders claims there are 600-800,000 people roadside and if you could tap them all for two Euros then you’ve got a nice earner. Only the likes of Flanders Classics, owner of the Tour of Flanders, tells Belgian newspaper Het Nieuwsblad it doesn’t want to go down this route. Instead the newspaper raises the plight of races with shakier finances and suggests they’re the ones in need of new income. This is a taller order, for example this week it sounds like the season-ending race in Belgium, the Nationale Sluitingsprijs, could be back on after initially announced as finished and it’s this kind of race that needs a boost but it’s a hard sell. How much would you pay to stand here for three hours? This brings us to the existential question of whether it’d be worth paying for. Frankly standing beside a road waiting for a race to speed past at 45km/h is not always the best of experiences and having to pay would force people to confront this. One solution is to offer something in return for the money: catering, toilets, wifi and large screen TVs within your line of sight so you don’t miss a thing. Pricing what has been free may not happen in isolation. Others could quickly get €-signs in their eyes. Nowadays a lot of bike races happen precisely because people are not out to charge everyone the going rate, for example the police don’t charge at all or if they do they attend then they bill a subsidised rate. Right now a local mayor or regional politician might take pride in hosting a race but tomorrow they could demand a day’s rent for the private space or even bill the race fees for litter collection. In no time at all a bike race goes from the public space to the private sphere. 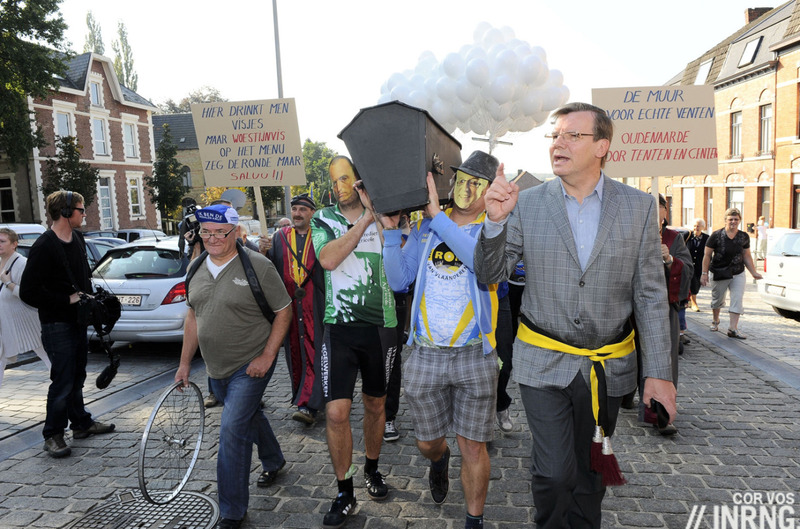 It happens already, the Heuvelland municipality tries to tax races for climbing the Kemmelberg and ASO changed the route of the Flèche Wallonne to detour a town called Ham rather than get taken for jambons by the mayor who demanded payment for use of the roads. Another issue is who gains? If it’s just to expand the profit margin for event promoters then it’s bound to annoy some. But if it’s to keep a race going it might be more tolerable. Remember this is Belgium we’re talking about and having a bike race on your doorstep is practically a birthright; so much that the locals of Geraardsbergen protested when the Muur was dropped from De Ronde. Similarly pro cycling is deemed so central to public life that it’s enshrined in law that many bike races that have to be shown free-to-air in Belgium, as opposed to subscription or pay-per-view broadcasters. Let’s go beyond Belgium, what if the huge crowds on a summit finish could be tapped for cash? Imagine ticketing Alpe d’Huez or Mont Ventoux? A bonanza perhaps but once again this would bolster the wealthy races that don’t need the money while the smaller races struggle. Also to reprise the notion of a bike race as an event in the public sphere, races like the Tour de France hold a place in French cultural life precisely because they’re popular events. Instead the money is in the adage that “if you’re not paying for the product then you are the product” and all the millions who stand beside the road enrich the race. Literally because their presence enables the publicity caravan and metaphorically because the roaring crowd – minus a few morons looking to get in the way – ennobles the event. Proof of the “you’re the product” concept is the publicity caravan. 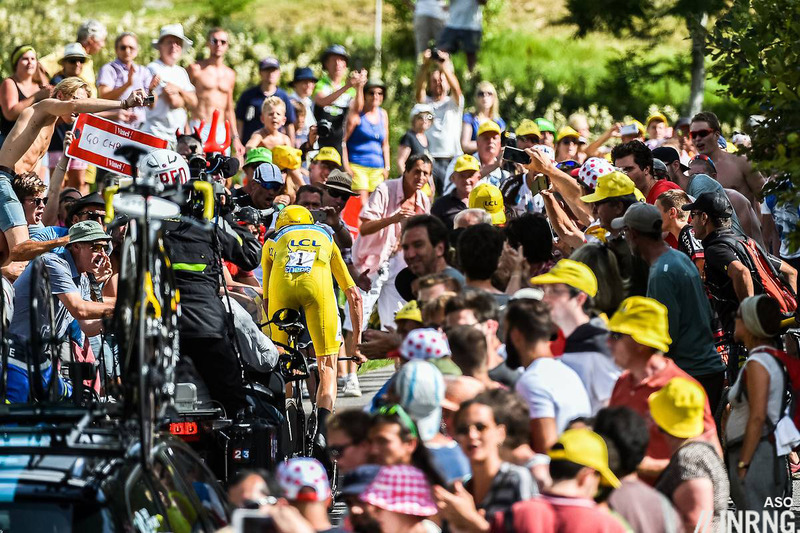 The Tour de France has a huge one and it’s both lucrative and effective, a massive money-spinner for race owners ASO and multinationals participants like Nestlé and Mondelez attribute double-digit sales growth to participation. As well as being very receptive to the messages by the time it’s passed through tens of thousands of people are dressed in the sponsor’s gear. Flanders Classics owns the Omloop Het Nieuwsblad, Dwars Door Vlaanderen, Gent-Wevelgem, the Ronde van Vlaanderen, the Scheldeprijs and the Brabantse Pijl so there’s possibly an avenue to explore here but again it’s a case of the best races being able to earn more. Meanwhile a lesser event struggles, it just won’t have a valuable proposition for a corporate caravan, let alone the marketing department to coordinate this. As things stand the big races don’t need to charge and the smaller ones would struggle to get away with it. A few races already charge money and if more want to try then why not? The irony is that the sport has become more free to watch these days, you can even walk into the Roubaix velodrome without paying. Ticketing could become a thing but it’d be a cultural shock if done in established places, perhaps it’d be easier for Brits to pay up than Belgians? Proponents may need to beware of unintended consequences, especially if the police and local government respond by trying to charge for road closures and more. It’s risky act of pricing something that has always been free because it prompts a monetary cost-benefit analysis that wasn’t there before. The holy grail, or at least the golden fleece, would be to make Tour de France a summit finish like ticket-only but you wonder if this simply becomes a boon for fencing suppliers and private security guards. What could work instead is a “fan zone” where there are big TVs and other facilities to help pass the time. When I paid to see the Olympic Road Race on Box Hill in 2012, I did feel that it went very much against the traditions and soul of cycling to do so, but was able to justify it to myself on the grounds of the one-off nature of the event, multiple passes up the hill and the presence of screens, beer, etc. This would seem to back up your view that it’s probably not a viable option for smaller races? I went up Box Hill for the road race and just found a space on the road side for free. Except we got a nice spot next to a TV screen a pub erected and, somehow, barely any spectators as we were right next to the closed off feed zone. For no money at all i had an exceptional experience and some people i know who paid felt really angry that they got so little for their ticket. To make charging viable races will need to offer more than a spot on a road side. The “VIP Area” model would work well, just closing off specific parts of the course and charging access fee. Then set-up a few extras, like a TV screen and some food/drink offerings, and actually you’ll have a good product to offer the fans. It’s an old model as you say INRNG, used in Belgium and Holland for years at selected Criteriums and at the end of road events when it was common to finish on tracks all over Europe. What is different about the current situation is that organizers are going to ask for payment simply to enter a ‘closed’ zone on a race course. Flanders offers the model, and whilst it may be considered by some a successful corporate undertaking, it has dictated the parcours to a great extent and killed the atmosphere for most supporters. 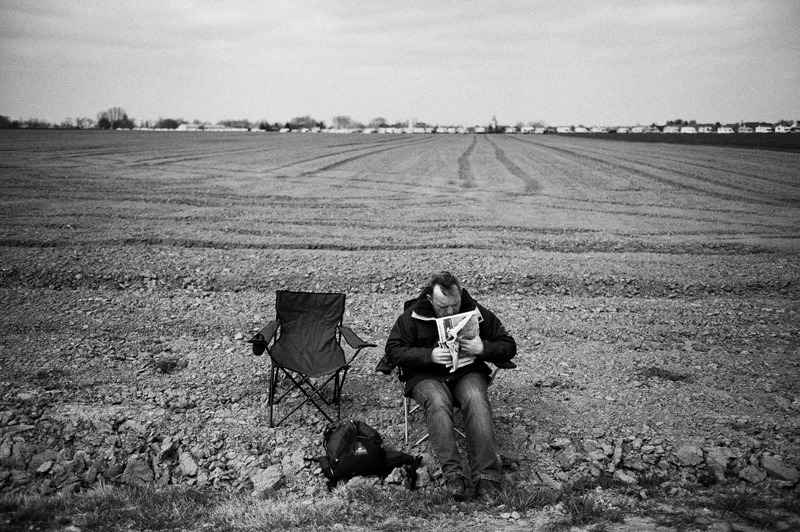 I gave up going to the Kwaremont the year after the VIP area was erected. The atmosphere was completely lacking, spectator numbers much reduced and the viewing areas left much to be desired, even in the cordoned off ‘field’. There clearly has to be some new approach to event finance, but pursuing the current model will probably not be the answer organizers are seeking. I sure hope it doesn’t come to this. Driving the crowds away is not going to help this sport. In the UK i’ve been to one or two Tour Series events nearly every year for a while now. There’s no fee to go to these Crits, but it’d be very easy to make some money off the public by limiting access to the course, or at least the Start/Finish line. The Tour Series throws on other attractions, various “fun” or junior races, music, entertainment, TV screens etc. It’s a product worth paying for, because it’s more than pure access to a road side. Compare that to a Tour of Britain. Ok there’s screens and things in some patches and around the Finish line, but for the majority of the route there’s nothing. Even at the action spots there’s little offering, and a race like the Tour of Britain doesn’t have guaranteed action spots. Who’s going to pay to stand on a roadside just to watch nothing happen with the racing going on elsewhere? And let’s not even mention what would happen if an Extreme Weather Protocol was activated and the route was changed or cancelled. Refunds, sure, but if a race has invested in extras with your ticket that’s lost money for them. I would assume like many sporting events that the organiser would take out insurance which would pay out in the event of the EWP being implemented and refunds having to be given out. The professional organisers maybe, but the smaller ones too? But look at how the EWP is implemented, often it’s one the morning of the race or even after the stage has begun. Now you’ve got fans who’ve paid money and turned up only for things to change. It might not lose you money, but the damage is done to the fan base who’s unhappy at the wasted time and effort. The fact they’ve paid will lead to a level of expectation that something like the EWP doesn’t exactly work with. I would not pay to watch a race go by at the roadside, stood on an uneven grass verge for hours hoping I don’t need the toilet (because there isn’t one). However, if they shook a bucket at me I would happily chip in to contribute to a wonderful sport! As soon as you start to charge people for certain viewing areas it separates and divides those that love the sport, them and us! However, races cannot survive on fresh air I realise that. Cash raises expectations. If something is free there’s no obligation. If you pay there is obligation. I booked a holiday flat in Morzine for last years TdF. We ended up 75m from the finish line with the VIP area across the street from us. From our balcony, we had cover from the rain and a fantastic view right into the VIP areas big screens. Great for us, but pretty annoying for anyone who has the misfortune of ending up behind the massive VIP zone busses that expand upwards to double in size. Sure, it seems like a great concept. Tables, food, drinks, screens, but it sure looked like the DULLEST place to enjoy the race. The real crowds were down in the rain with their picnics and caravan goodies. I know if I didn’t have the good luck of the balcony on the finish straight, I would have preferred the crush and excitement of the crowds rather than the boring VIP zone. One other fear, if they start charging to watch, will they start charging to ride the course in the morning? Famous sections year round? My experience of Backstage Passes / VIP zones is mainly at music events and I have found them to be boring. People are either there to work, to have a go on the free refreshments or to try and get close to a celeb, none of which add positively to the communal atmosphere or are directly focused on the spectacle at hand. I prefer to be in the crowd of people whose primary motivation is to experience the show. There’s a lot of networking happening. The VIP zones at the Tour de France are often for race sponsors, so for example the management of, say, Carrefour the mountains jersey sponsor, can invite a local supplier out for the day, put them in a helicopter for 20 minutes to see the race and then wine n’dine by the finish line. 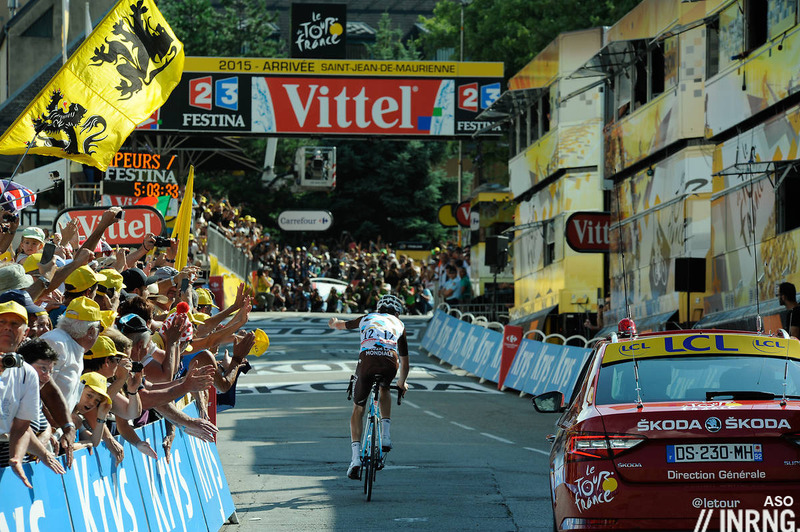 Who won the stage that day is often incidental. Perhaps, that’s where TMs should be, talking with *potential sponsors*, too, invited by the race organisers or the team themselves (while DSs direct riders on the road). Is it already happening? I hope so. Gabriele – EXCELLENT point – the organisers should use these VIP areas (and their extensive networking avenues) to help teams groom potential sponsors. This would greatly help reduce sponsor turnover issues, or the issues that sponsor turnover brings to this sport. However, reducing team instability isn’t part of ASO’s modus operandi, as much as I (and many here I hope) believe it would help the sport overall. It’s still a dog-eat-dog sport. CA, don’t you suspect that (as sponsoring cycling is comparatively cheap) if it wasn’t for the incessant cases of cheating (or what we all know is cheating, but they got away with it) the sponsorship issue simply wouldn’t exist? Cycling needs to stop being a sport of loopholes, excuses, dodgy decisions by the authorities and the legal use of drugs that evidently should be banned (e.g. tr4madol or corticosteroids outwith competition). Yes, other sports are just as bad, but they don’t have the reputation that cycling does amongst the public, so cycling has to show that it is doing more. That’ll have a much greater effect than schmoozing. I believe that CA got it right when writing “It’s still a dog-eat-dog sport”. Every party in cycling is thinking about the edge they can get over counterparts… which are the other social actors of the sport. Throw in the mix the media, public institutions, the public (roadside spectators or TV viewers) – it’s a chaos. The so-called cheating issue has been fostered by sponsors to be able to buy results whatever the technical component of DSs and riders (build up the riders you need to conquer a given public; make strategic skills irrelevant, so that a predictable setup is easier to achieve, again, through mere spending); by federations, for obvious nationalistic reasons (besides economic ones – like the share of public funding they could get); by cycling institutions to blackmail teams and/or organisers (the riders were usually, but not always, more like mere pawns, collateral damage, then direct targets – with notable exceptions); by teams, to put riders under pressure; by media, for self-referential clickbaiting or, again, nationalistic purposes. It’s not just about “cases” of cheating, it’s like the so-called cheating being a strategic and political element which is (I’d love to put a past tense, here, but I just don’t feel like that) crucial within the sport. It’s one consequence more of the mentality which CA hinted at: nobody is going to turn down such a convenient weapon in the struggles within the sport itself. There are also people who thrive over the decline of pro races because roads, sponsors and security forces become more available for the way more profitable cyclosportives… What if they were in business with a NOC and hence with its NADO? PS It must be said that, in general terms, things look to be more “under control”, that is, a bit less self-destructive than some years ago. People pay big money to watch NFL football games – the stadium and production make it a full event. Yes everyone could watch on TV, but the real experience is much more. I agree with Inrng – the fanzone – (or experience zone) has potential. If the cycling organizers put the effort in, they could make experiences that can’t be replicated on the couch. This might include big screen TVs, ‘exclusive’ access and special guests, in a manner that is ‘limited.’ I personally am a fan of seeing riders visit such a zone more than once. On the other hand, no “fanzone” can replicate my couch. And I only have to smell my own beer farts there too. Interesting ideas. In the USA plutocrats get the public to pony up for their sports stadiums but offer no discounts to them to see the spectacles inside, though they can usually watch on TV for free. It doesn’t bother me when bike races set up grandstands at the finish lines (velodrome, etc.) and charge to get in there, but the rest of the race is on public roads and should be open to the public at no charge. I’ve often wondered what the charges are (if any) for the closing of roads, police and other security? They might be no-charge for an iconic national event, but where do you draw the line when providing taxpayer funded services to for-profit ventures using the public roads? Usually races have to pay for road closures and police etc. I doubt many events at all get public/tax money to cover, beyond some of the really big ones like the Tour (and even then i doubt the French are willing to provide majority costs). Races are expensive to host as a result, otherwise they’d all be public run and have no sponsorships needs. I find it hard to believe LeTour pays the entire cost of the security. It’s been a decade since I’ve seen it live, in-person but the busloads of gendarmes and other military and polices have to be fed, housed and paid to be out there for 3+ weeks. The costs involved must be staggering. Il Giro doesn’t seem to be nearly as big an operation, but still there are a lot of security people involved and even if they worked as volunteers the transportation, housing and other costs have to be steep. When the Tour was in the UK in 2014, the local authorities’ published costs included items for “security” and “traffic management”. It may have been different because it was the Grand Depart, but it implies that ASO get the local taxpayers to pick up the tab for those aspects. And, perhaps surprisingly, cycling is more than Le Tour and Il Giro. These major events do get extra backing from goverment, but equally they are the events that don’t need it as much. There has to be a recognition that smaller events exist and struggle financially, which is where ticketing can become a viable revenue stream and where the focus should be. Usually races have to pay for road closures and police etc. It depends. You can look up the town hosting contract for the Tour of California. A number of cities that have paid for the privilege had to publish the agreement as a matter of public record. In it, you’ll see that the Tour of California puts the burden of all security matters, including rolling enclosure, on the host city. That document is interesting in the sense of you get an idea of all the “stuff” required to produce a reasonably professionally produced race and the enhanced role advertisers play. Smaller races, even on a national scale, typically require the promoter to pay steep prices for law enforcement attendance, road closures, and so much more. Add to that the federation skimming revenue a number of different ways and the economics are not good. Paying a couple of euros would not be an issue, but would collecting it cause long queues? It’s advertising that usually brings in revenue (that’s why TV broadcasts a race), maybe they could get more creative with that. No,no, not on my watch! I already pay for races with my taxes. And it will only be the richer getting richer, as only they have the possibilities to charge. And the usa model for certain is no rolemodel. If somebody would have enough courage to open their mouth and say that teams like sky and bmc make races and racing unmanageable with all their “marginal gains” and introduce a budget cap, they could well be able to save the sport. Until that it will regulate itself into oblivion until we have crit racing and the soul of the sport is destroyed. This is a far bigger crisis for the sport than epo was. I’d never pay to stand at the side of a road myself and I think they’ll find an awful lot of people just don’t bother – and trying it with smaller races will surely result in the sort of crowds we see in the Middle East. The one upside of this would be if they did it on mountains on the Tour de France – that should thin the crowds. Why would anyone pay to see a post-Tour criterium? A pretend race. You say that but it seems that hundreds if not thousands do. The main problem I see, is that smaller races aren’t in a position to charge cities for hosting the start or finish of a race in the same way Flanders Classics or the ASO are. It’s just another case where public subsidies mostly go to those who are richest to begin with. I don’t think that bigger races are in a position to ask for entrance fees as long as they charge cities. Mayors would have an even harder time than today to justify the costs of races (from the fees to race organizers, to police and security (especially while the terror threat warning is at a 3 out of 4), to race related construction work (Liège just moved the finish of its Tour stage to where the 3km mark was originally meant to be as they couldn’t justify the several hundred thousands Euros it would have cost to accomodate the Tour in the city center) etc.) if the event they get in return isn’t free to attend. It’s not like the public isn’t already paying for the races through their taxes. As the big races attract a higher density of well known riders and have a more interesting caravan (let’s not pretend half the people at the Tour de France aren’t more interested in free gifts and cheerleaders than they are in the sport), I don’t really see what smaller races could offer that would make people willing to pay to see them. Depressing how many people think the aim of everything is to ‘monetise’ it and that making cash from something is inherently a good thing, as it is what life is all about, after all. The constant refrain of how cycling can’t survive without more money is shown to be nonsense by the fact that it’s lasted well over a hundred years. It’s greed, pure and simple. It is indeed the opposite. The sport could survive and thrive and build a heritage, as long as it was seen as a sport. The moment racing turned from a sport into a working place and this whole corporate bs came in, it’s downward spiralling begun and we are almost at the end of it. Cycling desintegrates. Now we have weapon dealers on jerseys. Not what I’d call sanity. But well, with trump, brexit, le pen, afd, wilder etc., that’s sadly our smallest problem. I’d just note that racing became a work place long before many of the events now seen as part of its sporting heritage. And the likes of Peugeot were combining arms manufacture and team sponsorship a long time ago too. Was there ever a time when bike racing was “purely” a sport? except that races drop off the calendar each year because they can’t afford to keep running them. They can’t even raise the basic sponsorship to get the race on the road, before thinking about extra revenue and monistising. A more even spread of the wealth is needed – the more profitable races should be made to support those less profitable. If things are run just by profit then the smaller races will continue to disappear. Same goes for the teams: equalising the amount of money they have would improve the sport. Run things based on money and all you’ll get is more money: the cycling will suffer. You seem to either forget or ignore the fact that the world isn’t the same as it was 100 years ago, or even 10 years ago. Running a race has become more complicated and expensive. Roads are in higher demand, and as such closing them is more complicated needing more effort to acomplish. This pushes up the cost. Cost of police hire and other security hire has increased over time, especially as police forces are generally being cut back and under-funded. This makes it harder to pay for the nessessary numbers to cover big routes and crowds. This pushes up the cost. It is harder to run races these days. The organisers need to have more money available to run them. Sponsorship can only go so far, and in a vastly more competitive advertising environment the companies have more options available and can be less willing to stump up the money to the organiser. So what’s the other alternatives for the race organisers? Get a better broadcast deal? For most races this isn’t an option given their size, the added cost of providing a broadcast, competitive market lowering their value. Get more sponsors? Same sort of problem, limited by event size and it’s a competitive market place. Charging fees to access parts of the route, seems like a genuinely viable option given the current state of various factors. For a lot of races it’s not a question of making money, it’s a question of can they even run the event. I’ve dabbled a hand in race organization before, it’s staggering what actually needs to happen to get a race on and at a high level. But as Inner Ring points out, who will pay to watch the Nationale Sluitingsprijs? As ITV Digital found out in the UK, people will not pay to watch lower level sport. So we accept that smaller races won’t be able to fund themselves and will have to rely on a shift in the basic structure on cycling to get more revenue streams? Because clearly they can’t get broadcast deals or more sponsors. What is the alternatve? If someone can give me a sustainable one i’ll be all for it. I would rater continue to not pay to see races, but if it’s pay a few quid or have the race discontinue i will pay… i guess crowdfunding could cover that gap actually. Here we get into the economic structure of the sport as the UCI has decided it to be. The UCI sees events as revenue sources without any other consideration. The costs charged by national and international federation are quite large for higher-ranked events that might-or-might-not be approved the next year depending on the whims of a visiting UCI/national official (that the race paid to fly/house/feed) with no end in sight. As such, it rumbles along as a very minor sport, dismal economics, with the exception of one event in the middle of the summer and the Olympics broadcast. Meanwhile mass participation events outside the UCI are flourishing. @Hammarling: Believe me, I know. And I understand. But I think it is more a problem of the whole sport and it won’t be solved by this. Instead we need to make the sport as a whole whole again. The agitators have created a toxic atmosphere between teams and in extension the riders on one side and the races on the other side (of course inside no side is united, which is making it even more difficult). And a lot of bad things come from this conflict and a lot of energy, imagination, chances go lost in this fight. And with cookson in velons and others bags, the races are practically the loser, because they can’t send the riders on social media to round up certain fans. Instead races are held at ransom with the riders staging strikes and refusing to ride (how can races protect themselves against that? They can’t. They either do what the riders/teams want or are always open to this possibility again). And of course this infight has consequences on the sponsors front, too. Why should a sponsor pay for a sport, that is in a fight with itself? Why should someone bind his name to the sport, when even the ones doing it are busy destroying it? Why should a mayor support a race, when all the race gets is bad press, when riders complain about the hotels, the roads, the blablabla or when the racing is boring, because teams can’t be bothered? Cycling gets less and less goodwill, because it shows none (just think about simple things like:not throw your waste away where you want. Hopeless) The teams and riders want it to be a business? Then it will become this. Very easy. The single parts of the sport run amok and there is nobody there to bring them to their senses. That happens when you have nobody on the helm (and that is being friendly towards cookson). Someone on here wrote, that in cycling many have a junkie mentality. This is more than true. For years we had more and more money in the sport than ever – yet it all isn’t enough. On the contrary, there are more losers than ever and the sport is hanging by a thread. That is the usual result of this sort of capitalism and that is why I am against it and wasn’t very happy with the sport since 2000. The goal must be that the sport is good for everybody, not only for 1 or 2 teams. So it is time people wake up and say “enough”. It is time that riders are allowed to be great again. It is time uci and teams stop chasing ever more money and more world wide WT races/races for WT-teams, when this so clearly is hurting the sport (there is btw racing all year everywhere around the world, just ask Teams like UKYO etc., but of course it isn’t supported by the uci like they support WT-another failure, because they should get more support than WT, not less. Then maybe, they would get their share of limelight and with that cycling as a whole would get supported). It is time people get their priorities right and take their responsibilities serious. For example: It can’t be, that the teams hurt the sport so bad with making a farce out of the biggest race like they did with last year’s Tour de France (and no, this has nothing to do with the course, if they want to race, they would have raced). That was ridiculous and with whole parts of the press being fans, it all gets glossed over. It gets ever clearer, as the sport becomes less and less relevant (it can not even attract politicians these days), that the sport must answer now the question: What is it’s meaning? Why have races at all? Why cycling? If it is just a job as other jobs, I don’t think it can survive. This autumn, when hopefully a new president gets eletced, it may well be cycling’s last big chance to become meaningful and relevant again. What I am worried about is that the whole pyramid will crumble if no one is willing to organise lower level races for no money and little spectators. Where are our future road warriors going to learn the tools of the trade? I guess this is something where the bigger players and the authorities ought to make an effort and find viable solutions together. Look, if all were for the best, if making it “professional” would indeed further and help the sport, I would be all for it, so would be everybody who has cycling’s interest at heart. But it is not. Just look at it. People often overlook, that everything has consequences. People who do it as a job, make for example totally different decisions and choices, than people who do it, because they care and love it. It is a wider society context, where globalisation means in the end nothing more than capitalism. With globalisation, business (meaning also races, teams and sponsors) suddenly had competitors, who can operate on totally different rules and grounds and so they are forced to adapt or be left behind. This brought “a brutalization” in some countries of how people have to work (when I look 10 years back, it is even hard to believe, that it is the same world. Back then work had to fulfill us, today you get looked strange at, for being so fancy) and this coldness and “I look only after myself” now sipped through into every day life. Meryl Streep said it right: Respect invites respect, care invites care and vice versa. And we see, as it could be argued people saw after the industrialisation etc., that when you let the people behind, when you lose sight of the fact, that every human life is important, people stand up. And very often this has horrible consequences for millions. What has globalisation really made better? The world has become a worse place in the last decades. Right now we have a few places in the world, where it is ok and the rest is in dissaray. At war or having a famine, being unliveable for certain people and so they flee to survive. It reminds me of Elysium. So to me it is ludicrous, that somebody still can think globalisation, money or making more money will solve anything or has a meaning. I think we will see either a turn around, where people realise that they are people and not tiny motors for the economy or we will have to face dark times. And locking yourself in, like uk and usa surely is just silly. Sorry to say it. Unluckily, some prefer to become even more like sheeps. Luckily, some wake up and are no longer like sheeps. There is hope: In Finland for example, they have a project to give people money, must for being a citizen of Finland (I made/wrote a few thoughtexperiments some time ago, how you could organise work better, where this was one of them: Disentangling working and money. I think it is high time. I don’t understand when we made the switch to think a human life is only worth, when it brings money? People do other things, that are just as important for a society, but that got totally lost). But to come back to racing. Just like the world, cycling experiences, what happens, if you let money talk and it isn’t nice or better or helping at all. You say it right: if it continues this way, cycling will get more removed from the people. The happy few will race then for the happy few. And in the end cycling won’t be viable anymore. You are also right, that we see a generation change in cycling organisation Many, that were in cycling for ages die or stop being involved and this of course brings new ways, this is normal. But it doesn’t have to mean people have to be less passionate. I always feel that we as societies lost passion and stopped taking care. We have to find that again, everyone must do their part to bring that back. And then we will have people again, who love to organise a race in their free time, cause it brings them fun, togetherness, they get thankfullnes back and it enriches their life. Just like it was 30 years ago, when many, who now step away from organising races, started it. This can’t be found when an agency comes in doing the same for money, it just can’t. And in reality, it is just on us, to make things like that happen again. We just have to stop accepting everything and really say, what we want and be ready to do something for it. But nowadays nobody wants to get involved. The question is, if enough people still care enough for cycling, to give it something (not only money) or if by now it has become merely entertainment. Because if it has become entertainment, people will just go and find something different to do, when it gets boring or demanding. So in short (ok, long): You can’t disentangle what happens in cycling from the general situation. Cycling is only a mini version of the world. And as we saw in the real world, that globalisation only made the rich richer and wiped almost out the whole rest, that can’t compete, we see the same in cycling. So anybody wants to spin me that more money is a solution, better has arguments other than: Right now we don’t have enough money. Because wanting more money, putting money first and losing sight of the fact, that other things also have values, brought us in this situation, that we need more money! Sorry for being so long winded, can’t talk/write different. Not sure I agree about the world-wide effects of globalisation. Average real incomes across the globe have doubled since the fall of Communism, life expectancy has increased dramatically and hundreds of millions of people have been lifted out of poverty, especially in China and South East Asia. And in previous decades, the sort of destructive civil war we now see in Syria and Iraq was prevalent across Latin America, Africa and South East Asia too. Unfortunately for cycling, the sector of society which has missed out includes much of its historic fan base, so the sport is feeling the negative impacts. But that hardly means the globalisation has been all bad. Nick, what you don’t mention – and what the graph shows – is the amount of money that has been put in the hands of the top 1%. That’s who things are run for. The Asian middle classes benefitting is a side effect. I did mention “the better off in their own countries”, but either way, I’m not sure the motives behind globalisation have as much of an impact on bike races as its effects do. Nick, I agree with your point when monetary economy is concerned, but I think that Anon’s reflections included some passages which went a little further and which might be interesting. Is life about quantity? More particularly, quantity of money? Not so sure about that – and I’m not dismissing the meaning of wages as an index of a broader range of factors nor their importance in themselves. I just suspect that such an index also hides crucial aspects, like the general distribution of power, the structure of individual rights, equal or open access to fundamental ingredients of freedom like education, information, relative existential stability and so on. It’s not just about the labour moving away, it’s about renouncing to affirm the existence of some priorities which, in a given sociocultural paradigm, just prime or tend to prime or are expected to prime over profit and the economic facets of private and collective life. In several European countries it couldn’t be conceived, not so many years ago, that you’d let hundreds or thousandas of your citizens dying out of mere lack of access to *existing and available therapies* because of budget reasons (I’m not speaking of technical limitations, like absolutely unaffordable costs, limited number of a given equipment, limited number of skilled staff). That’s been normalised. Laws protected labour over profit, asserting that since one of the main purposes of a State is to grant employment to its citizens, maintaining a job should prevail over optimising profits (unless the company was actually losing money, that is, facing “negative profit”). It was considered important and favourable for the society as a whole that an average honest worker in a productive sector could expect a certain degree of stability, allowing him or her to establish middle to long term life projects based on his or her expected salary. Raising to the higher level of education which your capability allows you to attain was deemed to be a personal right from an individual POV and making that possible was one of the main aim of the State. That every human being should be granted a basic satisfaction of the most essential needings (say, shelter) prevailed by Law over most economic rights (like, the banks’ interests). That’s been changed. I’m speaking of a model for the society which is *not* unaffordable, not at all, not even *because of the crisis* (you can check figures), and which has been heavily under attack during the last 30-40 years. Globalisation didn’t simply determine that, but it was absolutely instrumental in doing that (among many other effects, sure). Since we’re speaking of a cultural model which doesn’t depend on how rich a society might become, it won’t be available again, nor in Europe nor in Asia, just making people a little richer from a monetary POV. Look at the USA, even when things were going a little better for them, too. Overall, they had got worse education, worse children poverty and worse health assistance than Cuba… and I’m not trying to sell Cuba as any sort of exemplary model, it’s an extremely poor country with huge problems, yet a rich country (the richest, in a sense? ), even when the money was circulating more decently than now, wasn’t able to grant that sort of existential framework to their citizens. USA citizens chose that solution (or a substitubional illusion) in a (more or less) conscious way, but once that any cultural reference to a different model of society is lost, nobody can choose anything anymore. The dismissing of the European structure of rights (but to a lesser extent you could find them also in Latin America – quite often thanks to or despite of the wars you hinted at) means an important tool less for everyone, when the achieving of a dignified life for the mere fact of being human (as opposed to be “a productive worker” or “a consumer” or whatever) is concerned. @Gabriele, don’t know where this reply will sort itself in, just want to say (as the anon): Thank you for putting so beautifully, what I wanted to say and indeed going beyond it. I thought about answering Nick (but don’t have to now), because indeed the very essence of my comment was, that it isn’t just about monetary wealth and that we see time and time again, in history, that we get bitten in our behinds when we forget that truth and yet we never seem to learn that special lesson (put not that beautifully). I think at one point we simply HAVE to learn and rise beyond this stupid point? So why not now? Am very, very thankful, that I have been understood! I agree that the events should be left free. They’re part of a ‘bigger’ thing – part cultural, part celebration, part health education, part many things that should not have a price tag attached to them. The dedicated fan pays in any case; this past month I’ve bought a new saddle, wheel set and a jacket. Which is fine, I love getting out and about and at least looking the part. So what? But charging the casual on-looker is not the way to go. We should be encouraging people in, especially kids, and keeping the sport accessible (at least to watch) is something to be proud of. One of the last great ‘public’ sports. The problem, as I see it, is that unlike most other sporting events where you pay to watch live, there’s no guarantee in cycling of seeing the ‘key moment’. It’d be like paying to watch live football where you could only see the middle third of the pitch. Which is why you’d need the fan zone idea with widescreen TVs etc. Otherwise you’re just forcing people to reflect on the intrinsic value of standing beside the road and as entertainment goes it may be that a cinema/basketball etc offers more value. I should have put in the piece above that “fan zones” already exist in many countries, only they’re called cafés and bars. You can sit in one and enjoy some food and drink with the race on TV and then run out to watch the race go by for yourself before going back inside to watch on TV. If my extensive garden lines the road on part of the course, how do they propose to charge me? Answer, they can’t. No need to say that the public is part of the *sport*, as it is in football (home and away matches), albeit in a different way… plenty of riders’ interviews to highlight that. But it won’t ever be stressed enough how much the public is part of the *show* in cycling, especially in modern one (when you market less the heroic concept of riders into the wild than the idea of *event*). We’ve seen GT organisers placing certain weekend stages in certain regions in order to grant top crowds for TV, sometimes even ignoring the sporting factor (technical nature of the stage). Crowded stages actually give rise to new races and whole new regional concepts to be sold for cycling tourism (Yorkshire anyone? Zoncolan and relatively remote Carnia?). That wouldn’t be the same with empty roadsides. Other races fell in disgrace out of lack of crowds, among many other factors, sure. But let’s not pretend that the lack of crowds in Bejing or in Qatar weren’t a *constant* subject of comments – which didn’t help those races’ image to flourish, I’d say. Several Worlds in Italy had pay sectors, but their financiary results didn’t get much better with that. And, as Rick E underlined, crowds call crowds: the crowd is the spectacle, when you’re waiting two hours on the roadside. Giant screens are fine, but I’ll always remember the guys who brought their TV with a generator on Monte Trebbio in 2009, along with food and drinks they shared for free. The paradox inrng and other readers stressed is significant: only races which don’t need that much the money could enforce pay sectors. I might see that as vaguely acceptable only if it was *directly* bound to organisers supporting a significant number of not profitable (free to view) races, and if it was applied in a selected number of cases where the crowd is already becoming a problem in itself, hence needing some form of “ecologic control” (I don’t especially like that you do that through money, but even needing to reach the spot two days before and so might be a cost which is already selecting the public). Agree with the comments on a TV run off a generator or a car, it’s great when people get together like this on the side of a mountain. It makes you think about the rich races that don’t have crowds: how long until they bus people in for the day to help make the event look better? It’s not far fetched, the Tour of Beijing seemed to do this and so you wonder if the likes of Abu Dhabi offer locals and tourists a like a free shuttle bus to the finish, maybe a snack too… or even some Dirhams to help pad out the finishing straight for the cameras. How can events “limit access to the course”? Wouldn’t they need the blessing of the local authroties to do this? (I assume for money.) They don’t own the roads or even the land the races go through. 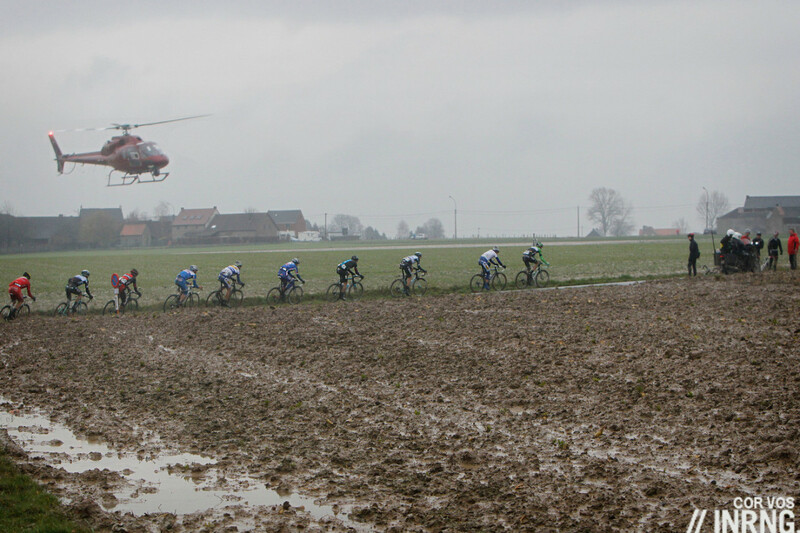 If I’m a farmer in my Flanders field they can’t charge me to sit on my own tractor as the peloton passes. I find the whole idea vaguely ludicrous and you can be sure that did I want to watch such an event I’d find a way to usurp the charge! They need the local authorities’ blessings to close the road in the first place, so adding this element would be potentially straight forward (though probably more costly). I think the RvV hospitality tents are on a field where the farmer has done just such a deal too. Yes. I appreciate that they basically have to pay people off for the rights to limit access. Still. There are other fields and other roads. They aren’t going to pay off everyone. Some big Belgian classics do make money of fans by charging for their sportif events the day before (RVV) or after (OHN) the event. If this pays for the costs of fencing of the roads etc. I guess it’s a good thing. Also organising women’s races means more exposure for your sponsors (not to mention the athletes of course!). Maybe all the struggling race promotors ought to promote a cyclocross-event during winter, I think all of those charge admission, and more than the 2-5€ bracket mentioned here. a sentimental thread for the good old days of road racing. Wake up and smell the tubular cement we are talking pro cycling at a high level and promoters need to do what is at the heart of making a profit. We may not like it but it is reality. No, it is not. That is exactly the point. There is nothing we have to “accept”. WE decide how we want our live and our society to be, not the other way around. We are the reality. And if enough people value other things more than money, you will see how fast things change. It is exactly the thinking “things are how they are”, that puts our lifes into other people hands and in the end people feel powerless. Because they are. But they gave the power away themselves. It is on us. If 20 people decide, to say “to hell” to feeling powerless and to the way “things are to be done and were always done” and decide, that organizing a race is worth their money and time, because it gives them happiness, I’ll bet they succeed easily and get a ton of people infected along the way. Because people are starved for something with a worth, something meaningful, something that makes them feel good (and no, I don’t want to denigrate the current race organisers, who have to give up, that is another subject with different reasons). But when everybody is afraid to do more than the other one, afraid to give anything, because others might get more or god forbid, they might do something for someone without getting something in cash value back, nothing will change. If we want things to change for the better, we have to do something for it. Open our minds and hearts is the first step. And although it may sound, as if this has nothing to do with this piece of course it is exactly about this piece. We are at a crossroads and have to decide, which way to go. Ok, am done, climbing down again. The acceptance is precisely the problem. The world is how it is because we made it that way – and things will only change when people realise that it’s not ‘human nature’ or ‘just how things have to be’. That’s as true of cycling as it is of everything else. We choose our society (those of us who don’t live under totalitarian regimes). This is true, but apparently a lot of people are choosing not to volunteer in the organisation of cycling races, I regret this as much as you do, but how are we going to turn that around? Because otherwhise those who choose to see some selected cycling races as a reasonable investment with an acceptable profit margin will take over those, turn them into something we might not recognize anymore and the rest will wither and disappear. Should authorities step up and support this part of (some countries’) cultural heritage wholeheartedly instead of just trying to benefit of it for political or economical goals? Should the media do something? The rich organisers and teams? grassroots level. I put up $200 every year for our little Nevada City Classic race here in my backyard. How may others volunteer to course marshal, registration or ? for your local race? We need to do more for our sport! How do such things happen and why didn’t we do something? After writing my comment, I thought about psychology and the way some companies use our brain to get money from us. Then I was thinking: It is strange, that we allow that. Why did nobody say 20 years ago, when it started: “Hey, wait, you can’t just intentionally mine someone’s brain to make him/her do things they otherwise wouldn’t do.” Why has a person no right to say: No, I don’t want that? First: We are hammered every day, everywhere into believing business/economy is bigger than anything and they are allowed to do anything. They come first, because “without them we can’t survive” which is pure nonsense. The second reason is, that it is hard for us to unite behind something, that we can’t see, that has no countable value (and that is, although we have this inherent longing for sense and fulfillment and something higher!). But only one person in a group has to doubt and we get infected and fall like flies. Just think how many centuries the christian church had to bring the world into darkness and how many lifes were lost to get everybody to obey them (that is terrorism on a whole different scale!). And look how short their reign in reality was, although they were ready to do the most horrible things to control people and stay in power. And third: It is hard to keep up with new things. Plus these days so many people are affected. It wasn’t this way a century ago. We learn by trial and error? But now technology has reached a level, that is bigger than us (and makes us obsolete in some parts) and it becomes ever harder to control the consequences. Just think anout electricity: If it would end to orrow, the world would suddenly stop. Most people have no real money anymore, they have just numbers on a screen. Almost nothing functions without electricity – isn’t that madness, if you look at it? But to us it is normal. Just the way it is. An example: Take phones. Just because we don’t see telephone signals, they are of course there, all around us. Just look at your phone how many Wifi spots are around you. You are encircled by them. And of course that affects us, come on, we are no fools, but what we don’t see, we can’t really grasp. So we feel a bit uneasy, but hold still, till something happens. And then we ask: Why did we hold still, who is in charge, how could this happen? I fear, the truth is, that we need leaders, to protect us from ourselves (see the psychology example), but we are not very good in chosing those leaders. And therefore we are not very well protected from ourselves. BUT I think the education many countries tried to provide since WWII has indeed changed the situation a bit and I have hopes, that we in the future come to new forms of governance, because I think there must be a better thing than democracy (although democracy is better than the rest, that we have now, but still, it is a crude solution, there must be better ways to have free, equal and peaceful societies). What I always think is the best thing, are practical things: Why not use this conversation as a stepping stone? Maybe someone, who is involved with racing or cycling clubs could tell us, what their needs are, how they experience things and what we can maybe do in our own city? Maybe it are small things like giving one afternoon to them helping to teach kids street rules? One afternoon is not much. But it is more than none afternoon. And talking about such things brings us closer to a solution. There is no crossroads. If you are not trying to produce a WorldTour event, you are at the mercy of the UCI’s whims, financial formula, and rights transfers. The UCI *is* the final arbiter, worldwide. If you are trying to produce a new WT event, the current method seems to be to buy event production from ASO or RCS and somehow buy the date from the UCI, site unseen. This is the realm of non-Democratic countries, demagogues, billionaire hobbyists, and misguided politicians. The events come and go and the sport rumbles on in relative obscurity. The tour down under is in my opinion the best way to monetize an event. It’s a small race, most riders are there to train and yet it is very successful. They base it in Adelaide. People travel from all across Australia (and the world) to see it and fill the hotels and campgrounds. It’s easy for them to plan as they keep all the stages close to Adelaide so you can stay in the one place the whole week. Sure, it isn’t a tour in the purest form but lets be practical. And as a result all the local businesses have a bonanza. Car hire, hotels, bars, restaurants, supermarkets, wineries. It is clearly a net gain for the city. Not to mention the exposure it gets for the rest of the year. The coverage is very smart to highlight the beauty of Adelaide but in a way that i find un-annoying and interesting. The costs of infrastructure and payment for a lot of hired people to enforce to let only spectators with a ticket to 200km roads in Flanders sound like you would end wit a huge deficit. 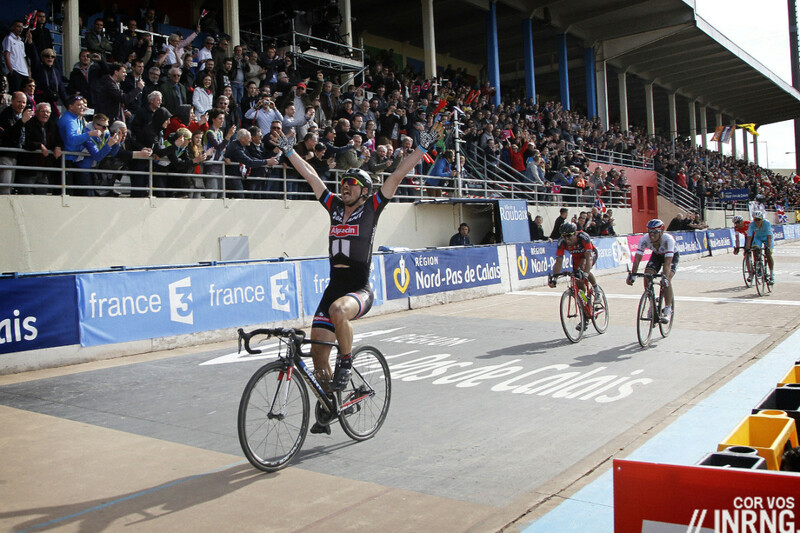 You coud do this on the finish line, or a small crit in a town centre, but not on hundreds of km races. But it’s a good plan if you want to drive some Belgians mad and provoke angry crowds. I tend to stick with free where available… Part of the joy when the tour came to Yorkshire was being able to walk to the route from my door… As a result it felt like the race was coming to be rather than the other way around. That said… It is on my list to take in a big classic, and since if already be committed to the tube of hundreds of pounds if gladly pay a small premium to ensure a better experience. I watched a very funny, but as ever frighteningly accurate, repeat of the 1980’s political comedy “Yes Minister” last night in which the privately-educated elite in the Civil Service conspired to ensure that real art (opera, museums, art galleries) remained subsidised over the suggestion that football (a mere past-time of the masses, albeit a very popular one) received alternate state finance instead. There is something of this in the suggestion to charge fans access to the races. Should sport be also classed as culture and, if so, where should it stand in the cultural queue for state subsidy? I appreciate a Van Gogh as much as the next jonge, but I’d rather admire a Van Avermaet. I should have said *real culture* as opposed to real art. Another thing to weight in is: often races are partly financed by public money. Cities pay to have a grand tour pass their city, pay for closing roads, placing fences and cleaning up. Even if they don’t pay, they issue a permit. And have to weight in the nuisance a race passing causes. They do pay and do issue permits to inspire people to go cycling and stimulate business. However for this support the public will demand free access. And cities will continue to give free acces. Revenue of vips tents is further used to limit spending of public money. So in the end the possibility of raising extra cash throught paying for access is limit by the role of public goodwill and money in organising races. I was thinking about this a while back and I think you don’t need to sell tickets, put up barriers or even demand payment. How’s this for an idea? When I was a kid the local carnival procession would roll through the town, with “floats” built on the back of trucks or tractor trailers and decorated by various groups. Behind every other float would be a pickup truck with a bed sheet suspended vertically in the back, collecting donations for charities, the float builders, etc etc; the crowds would throw money into the back of the pickup. It seems to me that especially at key points of popular races, this would work really well – roll the collector pickup up the Paterberg or Alpe d’Huez and the excited fans would make it worth your while. You might have to do it *after* the race has passed – so it can go slowly, and in case of someone slipping on badly-aimed coins in the road – but for people who’ve been waiting for hours that should be OK? Awesome stuff. Think I’m going to rent a bike from Fat lama and get involved. Here at the Tour Of Utah you can purchase vip packages that put you inside a vip car where you can view the race from the car, various scenic spots, and kom/sprint/finish spots. Some packages include vip access to team dinners and other events. There is also an event called the “Ultimate Challenge” where you ride (and pay for) the Queen Stage route. Which features a cat 1 and HC climb for the finale. This event was ridden by over 5,00 people last year. You can purchase vip access to start/finish areas that come with catering, big screen tvs and access to every rider from two teams at every start site. There obviously are ways for these events to raise money that do not impact or commercialize the actual race route. I however am in favor of a paid area on a circuit that also allows for fans to view for free on the opposite side of the road or next to the area.